In a bowl mix together the condensed milk, the cream and the lime juice. Reserve. In a small container add the rum and the orange juice. Dip the lady finger cookies at the juice and rum, but do not soak too much. In a tray, add the lady finger cookies in the bottom, then the lime mixture with lime zest on the top, then lady fingers again, then mixture again with lime zest. 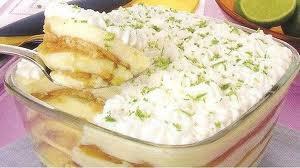 Add the whipped cream at the top and refrigerate for minimum 3 hours before eat.